Credit: GreenpeaceFile Photo / © Photabulous! Greenpeace announced today that it is launching one of its biggest ever expeditions – a pole to pole voyage from the Arctic to the Antarctic in order to promote a Global Ocean Treaty. The ambitious plans for a Global Ocean Treaty is urgently needed to give our oceans the protection they need, says Greenpeace. 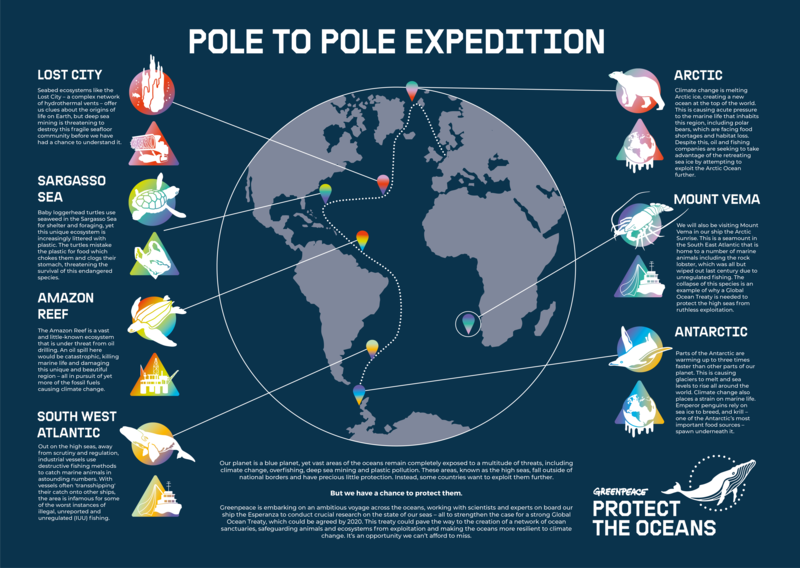 They are hoping the pole to pole trek, will highlight the many threats facing our global oceans, also known as the high seas. This is the area of the earth's oceans not bound by "flags, languages and national divisions". Together, these international waters encompass nearly half of our planet surface, and more than 64% of the world's oceans. Fast developing technology is changing access to the earth's vast oceans that were once, simply out of reach, being just too distant, too deep, too rough, too cold and too dangerous. The Protect the Oceans expedition will see scientists and campaigners team up to research the threats of climate change, overfishing, plastic pollution, deep sea mining and oil drilling. The team will be visiting many of the areas identified as in need of protection by the groundbreaking academic study 30×30: A Blueprint for Ocean Protection, released last week. “Our blue planet is under threat and it’s up to all of us to protect it,” said Frida Bengtsson of Greenpeace’s Protect the Oceans campaign.